Why are construction start-ups outpacing other sectors? New company formation is outstripping all other sectors, with retail at the other end of the scale. EARLIER THIS WEEK, TheJournal.ie reported that the rate of construction start-ups is up by almost 40% compared to the first six months of last year. As can be seen from the chart above, the rate of growth in companies being founded in the sector is far outpacing the sectors that are seeing the lowest levels of company foundation. We asked Vision-net, who publish the statistics based on company registrations, what marked construction apart from other sectors. Managing director Christine Cullen said that in large part is driven not by how vibrant the sector is, but by how far it has fallen. “The sector is starting from a low base” she explained. Apart from that, Cullen picked out increased bank lending and a view that property price falls are at an end as factors driving the establishment of more construction companies – this is also driving a pick-up in the number of real estate start-ups, which is up by 31.8% overall. Cullen said that the one sector that is truly struggling is wholesale and retail, where the number of new start-ups has fallen by 0.1%. Consumers’ willingness to spend will not have been helped by the introduction of the property tax and the prospect of water charges later this year. Looking to the future, however, she pointed to an increase in spending on big-ticket items like cars which may trickle down to smaller items in the retail sector. 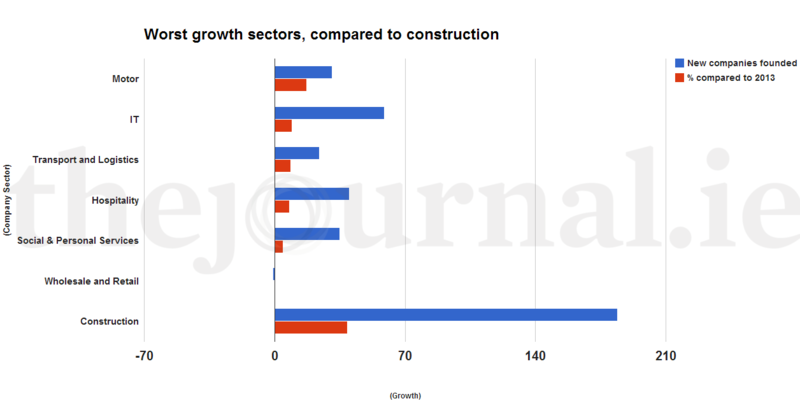 Email “Why are construction start-ups outpacing other sectors?”. Feedback on “Why are construction start-ups outpacing other sectors?”.